Running back Thomas Rawls, who left this past Saturday’s game against the Arizona Cardinals with a shoulder injury, sounds like he will be available to play when the Seahawks face the San Francisco 49ers on the road this week to close out the regular season. On Rawls, Pete Carroll said at his Monday afternoon press conference “I think he will end up going” when the Seattle head coach was asked about the running back position potentially being without Rawls for Sunday’s game at Santa Clara’s Levi’s Stadium. When Rawls went out of the lineup against Arizona, rookie Alex Collins saw his most significant playing time of the season. Collins, the team's 2016 fifth-round draft pick out of Arkansas, carried seven times for 28 yards (4.0-yard average) and caught all four of his targets for an additional 19 yards. Carroll said Collins has become more confident in recent weeks, and it showed against the Cardinals. “I think his confidence is gaining in what’s going on up front and seeing things,” Carroll said. "He was very aggressive, looked tough running the football, and very much in the style that we saw him when we went after him, so it was great to see that. Receiver Tyler Lockett, meanwhile, who had season-ending leg surgery late Saturday night, is “making it through it” and “feeling better today than he did after the surgery,” Carroll said, adding that Lockett could stay in the hospital to recover over the next couple of days. "He’s going to stay in the hospital another day or so because it’s easier for him,” Carroll said of Lockett. "We’ll see how that goes, it’s kind of day to day. He’s comfortable being there right now under the circumstances. "The surgery went exceptionally well and he has a real chance to come get back going four to six weeks from now and from there he’ll work his way back in a few months and have a chance to get himself going. He’s absolutely positively optimistic about all of that. Carroll also said Lockett’s injury does not include any ligament damage, and barring any setbacks or complications in his rehab and recovery, he expects Lockett to make it back for training camp in 2017. Third-year pro Paul Richardson played a bigger role this past weekend following Lockett’s second-quarter exit. The former Colorado standout caught four passes for 42 yards and a touchdown against Arizona, and while Carroll affirmed a roster move would be coming to account for Lockett’s loss, Richardson should continue to see his opportunities increase. 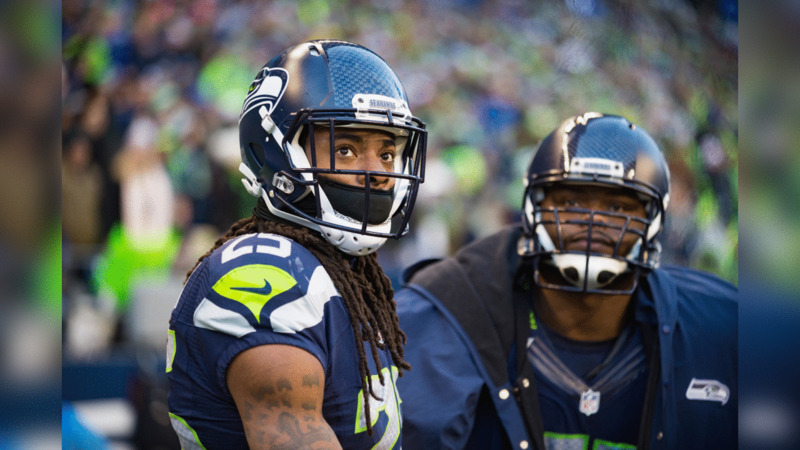 “Yeah, he did a very nice job for us in the game, too,” Carroll said of Richardson. "Came through for us on some big third-down plays and big touchdown catch and all that. He jumped at the opportunity, which is so often our case that we see our guys do that. When you give them a shot they come through and do something and I thought Paul really responded beautifully for us. Richardson also took over kick return duties after Lockett left, totaling 56 yards on two returns. It’s an area Carroll said Richardson could continue to cover in Lockett’s absence, though the team will also look at how recently-signed running back J.D. McKissic handles kickoffs at practice this week. Carroll was also asked about the status of strong safety Kam Chancellor (ankle) and defensive tackle Ahtyba Rubin (wrist), who each momentarily left this past Saturday’s game. Get close to the Seahawks with these sideline photos from the team's Week 16 game against the Cardinals at CenturyLink Field.